"Scientific CMOS Imaging“, Boyd Fowler, Fairchild Imaging, U.S.A.
“Design of CMOS Imagers: Selected Circuits and Architectures”, Alex Krymski, Alexima, U.S.A. Camera module cost reduction by wafer-level optics and by replacing auto-focus with EDoF; sharpness transportation v2 with twice the extended depth of field performance compared to the previous generation; yield improvements for wafer level cameras, as well as fix-focus and autofocus cameras. New camera module enhancements, such as autofocus convergence speedup, thin design (reduced camera module height), and improved low-light performances (larger aperture optics). DxO ISP5xxx: DxO Labs' programmable RTL ISP solution. DxO DPP: the newest product from DxO Labs features color shading and Gr/Gb imbalance correction without per-unit calibration leading to faster camera integration and lower costs. DxO Analyzer v3.3: image quality evaluation solution allowing sourcing of camera modules, evaluating samples, and complying with SMIA, ISO and upcoming I3A-CPIQ standards. www.dxomark.com: the RAW Image Quality online database to rank and compare all sensors, from cameraphones, DSCs, and DSLRs up to medium-format cameras. Tessera's Senior VP and GM Liam Goudge presents "The proliferation of smart camera imaging technologies"
Tessera's VP Yehudit Dagan presents "Image quality and wafer-level optics"
Joseph Sgro, CEO, ALACRON, USA presents "New camera and sensor with low noise in high frame rate applications"
Martin Wäny, CEO, AWAIBA, Portugal presents "TSV (true silicon via) based chip scale package and fully wafer assembled wafer level camera modules"
Mirko Schmidt, PhD Student, HEIDELBERG UNIVERSITY, Germany presents "Exact Modeling of 3D Time-of-Flight Cameras"
Randy Bockrath, CEO of IMATEST pesents "Speeding image sensor configuration"
IMATEST together with Aptina also gives 3-howur workshop "Image Sensor Configuration and Image Quality Testing" Instructors: Norman Koren Founder and CTO of IMATEST and Darryl Perks, Principal Engineer, APTINA UK. Frederic Guichard, CTO of DXO Labs gives another 3-hour workshop "Module to module variation: automatic calibration-less correction"
There are many more interesting presentations themes, most of them with speakers not announced yet. ...And you talked about some cylinders still not firing, I think we talked a lot about memory here. Any commentary on the LCD Driver IC business particularly, since I think that's off the J750 platform as well -- it seems like that kind of build on the LCD Driver IC side was potential customer is going to tightening any visibility on that cylinder firing in 2010? Yeah. Turns out the other two 750 based cylinders here, both image sensor and LCD driver have not been participating in the upsurge and, you know, in one sense that's been helpful to us because the microcontroller segment has been pushing us so much, so, you know, in an odd way we are grateful that that's been a little bit slower. That may emerge. We don't see in this coming quarter a big uptick in either of those two segments, so that's one of those areas that's has just been more depressed. But as you said, as things tighten, we may get some demand in that -- on that front. If I were wishing, I would hope that would come later, at the end of this quarter rather than at the beginning. But right now our short-term indicators are not that we are going to see anything -- any spike in those two segments of the J750 in the short term. "In optical image enhancement, at year-end 2009 we had four licensees for our extended depth of field technology, as we call EDOF, and those licensees were Toshiba, Samsung, STMicro and one not formally announced. One of our licensees began shipments of traditional camera modules with our EDOF technology for use in camera phones in October last year, and they increased production each subsequent month. This will generate our initial EDOF royalties in the first quarter of 2010. To date all our current EDOF licensees are deploying or anticipate deploying EDOF technology in traditional camera modules. We have contracts to provide our EDOF technology for traditional camera module projects from 2 megapixel through 8 megapixel. We anticipate EDOF will be deployed in wafer-level camera modules in the future as well. There is significant interest in our non-mechanical Zoom technology. Zoom is our first integrated smart solution and is a combination of our optical and embedded image enhancement technologies. 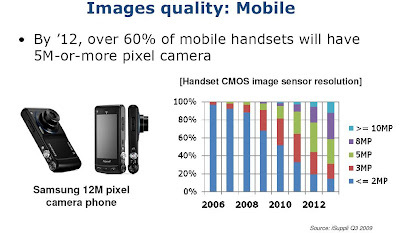 We expect it will generate higher royalty per unit than standalone optical or embedded image enhancement technologies. We expect to announce our first licensee for this technology in 2010. ...We expect [micro-optics} will be one of the main growth drivers of our Imaging & Optics revenues in 2010, along with increased EDOF royalties. We anticipate continued revenue growth from EDOF and micro-optics plus revenues from our wafer-level optics and Zoom will assist us in reaching our goal of $100 million in revenue in 2011 in this segment. Looking longer-term, today's 1 billion plus image sensor market, which includes camera phones and devices such as PCs, surveillance devices and toys, is forecasted to grow to more than $2.6 billion by 2013, according to Gartner Dataquest. We ... expanded our Imaging & Optics portfolio with the acquisition of certain assets of Dblur Technologies Ltd. This acquisition gave us one more entry point into the Chinese market. In addition, through this acquisition, we now have STMicro as one of our optical imaging enhancement licensees. In wafer-level optics, our product launch services surpassed the 1 million lens shipment mark in early January. In addition to our product launch services, we have two wafer-level optics licensees. Nemotek is production ready. Qtek is expected to start production later this year." Varioptic announced that it has developed its first liquid lens, A316S, offering Optical Image Stabilization functionality to mobile phones. With no moving parts, the new liquid lens, A316S, uses less than 50mW of power during a shot. The A316S liquid lens actuator, featuring both OIS and silent/smooth AF, is able to fit in typical AF camera module size. The stabilized video capture will be demonstrated during Mobile World Congress in Barcelona from 15th to 18th February 2010.
e2v (Chelmsford, UK), Princeton Instruments (Trenton, USA) and Photometrics (Tucson, USA) jointly announce the launch of new eXcelon back illuminated CCD and Electron Multiplication CCD (EMCCD) detector technology. The eXcelon sensors provide photon detection capabilities across a wide spectrum; from 200nm to 1100nm with enhanced sensitivity in the blue to NIR region. In addition, the eXcelon back illuminated sensors significantly reduce problematic etaloning – or the appearance of fringes due to constructive and destructive interference in the back thinned silicon when imaged in NIR region (750-1100nm). In the past, users interested in the NIR had to resort to using front illuminated or back illuminated deep depletion CCDs. However, each have unique drawbacks – front illuminated sensors have 2 to 3 times lower sensitivity; deep depletion devices have 100 times dark current which ultimately limits their usability. In contrast, eXcelon sensors do not increase dark current and boast ~90% quantum efficiency, while countering the etaloning. Princeton Instruments also has a white paper presenting new BSI CCD advantages. Incidentally, Ireland-based Andor Technology too presents BSI EMCCD camera with enhanced blue sensitivity: "Until now, back-illuminated EMCCD cameras have been made widely available only with a ‘mid-band’ anti-reflection (AR) coating, which results in a Quantum Efficiency curve that is optimized for the green/red wavelength range. However, some applications specifically require superior sensitivity performance in the wavelength region below 450nm for which iXon+ Blue is specifically optimized." It's not clear if Andor uses older or new BSI EMCCD device. Nintendo Turned Down 3DV ToF Technology? CVG quotes a rumor that Nintendo has evaluated 3DV ToF camera technology at the end of 2007 and turned it down because it was unconvinced it could sell the camera system at a Nintendo price point. Nintendo also had some worries around latency during gameplay. The articles wrongly equates 3DV ToF technology to Project Natal. However, the first generation Natal is known to be based on Primesense structured light approach. Albert Theuwissen continues the series of articles on PTC use to debug various problems in image sensors. The latest post is about row noise and its effects. The whole series has exceptional educational value. dpreview News Forum has an interesting discussion of New Scientist article on low-light imaging improvement. University of Lund, Sweden researches Almut Kelber and Eric Warrant together with Jonas Ambeck-Madsen and Hiromichi Yanagihara of the Toyota Motor Europe R&D centre in Brussels, Belgium develop an alrorithm mimicking insects vision. Insects make different trade-offs for different parts of the image, perhaps even optimising vision in each part independently. In theory, one region on an insect's retina could sum incoming photons for long periods to pick out the details of a flower head, say, while the rest could be optimised to probe the shadows for motion by increasing the number of photoreceptors from which signals are pooled. Warrant and his team call this mechanism "local adaptive spatiotemporal smoothing". It has become the inspiration for a new kind of digital image-processing algorithm, developed jointly by Warrant, mathematicians Henrik Malm and Magnus Oskarsson, also at Lund, and engineers at Toyota Motor Europe. It works by pooling the signals in neighbouring pixels both in space and time, while automatically looking for clues to determine the optimum amount of pooling for each part of the image. When objects are static the algorithm can pool in time and capture more spatial detail. Mathematically, this is the equivalent of setting the best exposure time and pixel size independently for every spot in every frame. Toyota explores this approach to improve vehicle night vision systems. "Mr. Nobukazu Teranishi was born in 1953. He received the B.S. and M.S. degrees in physics from University of Tokyo, 1976 and 1978, respectively. He has developed image sensors and cameras at NEC Corporation from 1978 to 2000 and at Matsushita Electric Industrial Co., Ltd. from 2000 to present. He is a general manager at Image Sensor Business Unit, Semiconductor Company. He has authored and co-authored 78 papers and has submitted 95 patents. He won the Prize of the President of KEIDANREN of National Invention Awards in 1994, Commendation by Minister of State for Science and Technology in 1997, and Niwa-Takayanagi Award from the Institute of Image Information and Television Engineers in 2000, by his contributions to image sensor technology development including the pinned photodiode invention. His group won the Technology Progress Award in 1986 from the Institute of Television Engineers of Japan, the Technology Award in 1986 from the Motion Picture and Television Society of Japan, the Emmy Award in 1991 by the broadcast-use CCD camera development. His group also won the Fujio Award in 1993 from the Institute of Television Engineers of Japan by the HDTV CCD image sensor technology development. He is a fellow of the Institute of Image Information and Television Engineers, where he served as a chairman of the paper editor committee and a chairman of the Information Sensing Committee. He is also a senior member of IEEE, where he served as a guest editor of IEEE Transactions on Electron Devices for s special issue on solid-state image sensors in 1997 and 2003. He also served as a general chairman for the 1999 and 2005 IEEE Workshop on Charge-Coupled Devices & Advanced Image Sensors. He is a member of the steering committee of the aforementioned workshop and the Walter Kosonocky Award. He was a sub-program committee member of the IEEE International Electron Devices Meeting in 1994, 1995, 2002, and 2003. He is a program committee member of the Electronic Imaging Conference." Nobukazu Teranishi is going to host IISW in 2011 in Japan. Yahoo: The third-generation Creative Vado HD video cam is powered by the Ambarella A2S SoC chip. It appears that Ambarella is quite successful in capturing hybrid video cameras market. Yahoo: Aptina announced that Given Imaging's PillCam COLON 2 includes Aptina’s MT9S526 medical image sensor. All three of Given Imaging’s ingestible PillCam products for small bowel, esophageal, and now colon imaging embed Aptina’s sensors. Aptina’s 10-year partnership with Given Imaging has helped propel Aptina into the leadership position in the medical image sensor market, according to TSR 2009 CCD/CMOS Area Image Sensor Market Analysis. The MT9S526 was designed specifically for medical applications where low power extends battery life, and low-light sensitive solutions can capture images in the dark—all in the small form factor required to fit inside an ingestible pill. PillCam COLON 2 includes two image sensors that can produce a wide range of frame rates up to 35fps, utilizing a 5.6um pixel in a 1/6-inch optical format and enclosed in sub-4mm chip scale packages. Yahoo: After speeding up Synopsys Sentaurus simulator, Acceleware helps Crosslight to run pixel simulations up to 100x faster. APSYS, Crosslight's 2/3D electrical and electromagnetics simulation tool for semiconductor design, combined with Acceleware's acceleration solution for the finite difference time domain (FDTD) algorithm now delivers simulation results up to 100x faster than the existing open source solver on a high end workstation. 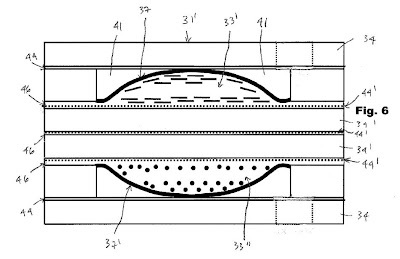 USPTO published first patent applications of the secretive Canadian startup Lensvector. The company seems to work on a compact way to do camera lens using liquid crystal (LC) structures. The company site does not give much information, other than saying it's under construction for the last 1.5 years or more. Application US20090213321 talks about LC flat lens with spatially changing refractive index. 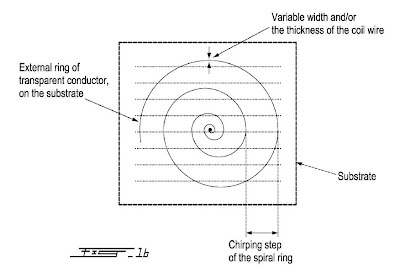 The index is controlled by means of spatially modulated electric field. Yahoo: SUSS MicroTec announces that Q-Technology Limited (Q Tech), manufacturer of compact camera modules for the cell phones, notebook computers and security industry, has successfully installed a full SUSS equipment set at Q Tech’s facility in Hi-Tech Industrial Park Kunshan City, Jiangsu Province, China. The 200mm mask and bond aligner, spin and spray coaters and wafer bond systems are utilized for Q Tech’s wafer-level camera manufacturing services. Yahoo: Tessera announced that SK Telesys has licensed Tessera’s FotoNation FaceTracker solution, which provides face detection and tracking capabilities for cell phones and digital still cameras. SK Telesys, based in Seoul, Korea, will integrate the Tessera technology into its W-Phone (SK-700) handset. From the demo it appears that Primesense system works with much finer hand movements as compared with Canesta. Primesense demo appears to be a part of a longer video, also showing the system reacts to quite faint hand gestures. Hamamatsu Photonics has developed the world’s first commercially available IR-enhanced silicon photodiodes with greater sensitivity in the near-infrared region from 950 nm to 1100 nm than conventional silicon photodiodes. The enhanced infrared sensitivity is achieved through the use of Hamamatsu’s proprietary laser processing technology to produce sensitivity-boosting microstructures on the silicon surface. To me this sounds a lot similar to SiOnyx claims. While SiOnyx mostly talks about photoresistor structure with huge photoresistive gain, Hamamatsu sensor is a photodiode. Still, the trick to apply laser processing to create surface microstructures seems to be quite similar. Hamamatsu targets to mass produce various types of inexpensive and easy-to-use silicon detectors with enhanced infrared sensitivity. Application areas are expected to include security, optical communications, thermal measurement, and fluorescence photometry. M. Perenzoni and L. Gonzo from Fondazione Bruno Kessler, Center for Materials and Microsystems, Povo, Italy, designed an image sensor powered by the incoming light energy. 100Lux is enough to operate its 25um pixels. Unfortunately, I/O pads need an additional supply to drive external load. Future work is supposed to solve this and also increase the sensor's resolution from the current 4x4. The paper is published by IET Electronics Letters, the full text is available on-line. Yahoo: Tessera announced that China-based Jiangyin Changjiang Advanced Packaging Corporation (JCAP) has licensed Tessera’s SHELLCASE MVP image sensor packaging technology. JCAP will use the SHELLCASE MVP technology in its production line for image sensor wafer-level packaging designed for portable products such as mobile phones, notebook and netbook computers, as well as camera products in consumer electronics. Aptina Eyes IPO in 18 Months? EETimes compiled a list of companies eyeing IPO in a year to 18 months time frame. Aptina is #2 in this list. Ambarella is #1. Yahoo: Tessera announced that it has shipped more than one million OptiML single-element VGA lenses via its Product Launch Services. The company introduced these services in September 2008 to provide licensees and their customers with early access to its wafer-level optics technology while licensees ramp up their high-volume manufacturing. Licensees of Tessera’s OptiML wafer-level optics technology include Nemotek S.A., which is already production-ready, and Q Technology Limited (Q Tech). IGN: Microsoft President of Entertainment and Devices Division Robbie Bach revealed that 70 percent of the game publishers are now developing titles for Project Natal, based on 3D camera for gesture recognition. Ambarella announces A5s family of SoC for hybrid HD video/still pocket cameras. The 45nm SoC is build around 533MHz ARM11 CPU and features full HD H.264 recording, 14MP of still photography, and the ability to capture HD and internet video simultaneously. The A5s family consists of three products: A5s25, A5s30 and A5s50. The A5s25 can capture 10 MP still pictures as well as generate and compress high-definition video in both 720p60 and 1080p30 formats. The A5s30 enables burst recording of 8 MP still images at 30 frames per second with appropriate sensors. The A5s50 supports the standard interlaced HD broadcast format 1080i60 optimized for display on TV. The A5s SoC and evaluation kit are available now. Ambarella expects that full HD consumer hybrid cameras based on the A5s platform will be priced at or under the critical US $149 end-user price threshold in 2010. I've missed this news from almost two weeks ago, thanks to R.C. for sending me this item. Yahoo: Omnivision announced that Xinping (James) He will resign from his position as COO and from the company's board of directors. Mr. He has decided to resign in order to pursue other interests. A new chapter in Albert Theuwissen's tutorial discusses column noise influence on PTC. Step by step the tutorial becomes the most exhaustive source of PTC knowledge available in open access. Harvest Imaging bvba, Bree, Belgium managed by Albert Theuwissen and Image Engineering Dietmar Wueller, Frechen, Germany, announce that both companies have signed a cooperation contract to develop a software tool that simulates the behaviour of image sensors. The new tool is intended to help camera manufacturers and system integrators to select the best sensor for their specific application. Frechen (Germany), the 8th of January 2010. Today Harvest Imaging bvba, Bree, Belgium managed by Albert Theuwissen and Image Engineering Dietmar Wueller, Frechen, Germany, signed a cooperation contract to develop a new software tool. “This tool will be a milestone for manufacturers and system integrators to specify the best sensors for different applications”, so Dietmar Wueller, CEO and CTO of Image Engineering. Both cooperating companies are confident that an application like this leads to a standardized set of technical specs for all sensors on the market and will both strengthen their efforts to get in this direction. The new sensor simulation software tool will be available within the next 12 month and sold through Image Engineering and its worldwide reseller network. After retirement from DALSA and Philips, Albert Theuwissen founded Harvest Imaging in 2007. The company is focusing on training, teaching, advising and consulting in the field of solid-state imaging systems. Harvest Imaging offers public courses as well as tailored in-house training. In 2010 a new course based on hands-on measurements on commercially available cameras will be introduced. This will be the very first course ever in the field of digital imaging offering the participants hands-on experience. The consulting activities focus on assisting imaging engineers in their daily work: specifying their sensor or camera, designing an imager or camera, evaluation of imagers or cameras, qualification of their system, organizing and chairing technical review meetings, selection of design houses, selection of wafer fabs, etc. Harvest Imaging is a world leading company in providing technical know-how in the field of digital imaging. Since 1997 Image Engineering is the leading independent testlab for image capture devices in the world, covering still and video devices. On a regular basis Digital Still Cameras are tested for the German photographic magazines Color Foto and c’t as well as for a lot of manufacturers including Fujifilm, Leica, Olympus, Panasonic, Ricoh, Sony. Cell Phone cameras are tested for carriers like Vodafone and numerous cell phone manufacturers. Occasionally camcorders, video cameras, broadcast cameras, and scanners are tested for magazines as well as manufacturers and finally cameras for all kinds of applications like security, automotive, machine vision, and remote sensing have been tested over the past years for various companies. Since 2006 when „Esser Test Charts“ was bought, Image Engineering has become the leading supplier for test equipment in the area of digital capture devices. The majority of the more than 260 different test charts is designed for video and broadcast applications. Image Engineering is active in a variety of standardization activities among which are ISO TC42 (Photography), SMPTE (Society of Motion Picture and Television Engineers), CPIQ (Cell Phone Image Quality), and EMVA (European Machine Vision Association). IEEE CPMT Society presents "High-Reliability Through-Silicon Via (TSV) Solutions for Image Sensor Packaging" lecture by Belgacem Haba, Fellow and Chief Technology Officer, Interconnect, Components & Materials (ICM), Tessera on January 13, 2010 in Santa Clara, CA. "In 2009, the industry shipped 2.5 billion image sensor units with an average selling price of $5 – providing a total addressable market of $12B. This presentation will discuss image sensor and camera module trends and growth. It will trace the growing movement in the image sensor market from chip-on-board to wafer-level packaging for cost savings and other advantages. It also will trace the image sensor evolution toward wafer-level packaging and introduce TSV wafer-level chip-scale packaging, and how to address the barriers to adoption with a new approach." Sony has expanded its BSI sensor range. As Camcorderinfo.com reports, the new HDR-XR350V, HDR-CX350V, and HDR-CX300 mid-range video cameras feature 2.65MP 1/4-inch BSI illuminated sensors. This roughly translates to 1.75um pixel size, same as in 6.6MP 1/2.9-inch sensor announced a year ago. So, for now Sony appears to have 3 different BSI sensors, all based on 1.75um pixels: two for camcorders (consumer high-end 6.6MP and mid-range 2.6MP) and one 10.1MP for DSCs. 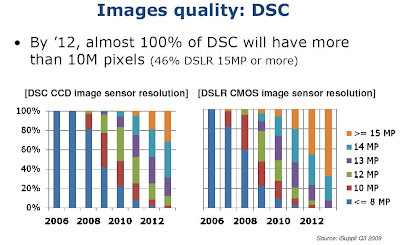 The 10.1MP BSI sensor debuted in 2009 Sony DSC models and also used in this year's HX5 and TX7 cameras (dpreview.com). Casio appears to utilize the same BSI sensor in the new EX-FH100 high-end DSC. For Casio this is the first BSI-enabled camera. Another new BSI sensor appears in Samsung camcorder line (camcorderinfo.com). The 10.1MP 1/2.33-inch sensor appears in HMX-S10, HMX-S15, and HMX-S16 video cameras representing the company's top range. While we are at backside-sensing camcorders, it's worth noting that JVC has announced its first BSI model GZ-HD620 for Japanese market about a month ago. One could expect a worldwide launch at this year CES, but this has not happened yet. JVC sensor is 1/4.1-inch, 3.32MP, based on 1.75um pixels like others. Update: JVC announced a line of BSI sensor equipped camcorders for North American market: flagship GZ-HM1, mid-range GZ-HM550, both based on 1/2.3-inch 10.62MP sensor and the previously announced in Japan GZ-HD620 based on 1/4.1-inch 3.32MP sensor. Yahoo: Omnivision announced OV9726 - a native HD video sensor built on 1.75um BSI pixel technology. The 1/6-inch OV9726 delivers 720p HD video at 30fps and targets cameras in notebooks, netbooks, webcams, mobile phones, PMPs and other mobile entertainment devices. The pixel sensitivity is reported to be 1,480 mV/lux-sec. OmniVision has already secured design wins from top tier customers for the OV9726. The OV9726 is currently available for sampling, and is expected to enter mass production in Q1 2010. Yahoo: Another addition to Omivision sensor portfolio is OVM7692 VGA CameraCube. The sensor's compact size (2.8 x 3.2 x 2.5 mm) is said to be among the smallest VGA modules in the industry. The OVM7692 is a complete VGA camera solution including parallel and MIPI output interfaces, automatic luminance detection and an integrated EMI solution. OmniVision says it has already secured design wins for the OVM7692. The sensor is currently sampling and has been released to go into volume production. Primarily algorithmic-based application talks about trade-offs between a quality of focusing and a depth of focus. Aptina's EDoF approach is also presented in SPIE conference paper. As a side note, two of the inventors - Kartik Venkataraman and Robert Mullis left Micron in March 2008 to found Pelican Imaging together with Aman Jabbi, a former Head of video technologies at Micron. They were able to raise $7M in round A financing in August 2009 - quite an achievement these days. The new company is developing "computational cameras that can manipulate static, 2D images through three dimensions". The company site says: "At Pelican Imaging, we introduce a fundamental shift towards "software cameras" and address the challenges posed by conventional camera design, small pixels and the megapixel race. Pelican's technology will result in superior photographs & video, with new and exciting features and applications." 2 months ago Varioptic announced that Cognex will use its liquid lens in AF-enable ID readers. Now Cognex and Varioptic signed a licensing deal and partnership. Varioptic lenses are said to be in production with CSI at its Wuxi, China plant since January 2007 and also more recently, in mass production, with Japanese Seiko Instruments. Yahoo: The new OV14810 and OV14825 sensors are based on 1.4um BSI pixels and have 4,416 x 3,312 active array size. The sensor's speed is 15fps at full resolution, or 60fps in 1080p HD video mode using binning and providing some margins for electronic image stabilization. OV14810 is targeted to digital still/video cameras, while OV14825 is intended for mobile applications. The OV14810 and OV14825 are sampling now with reference platforms available, and will enter mass production in Q2 2010. Digitimes: Pixart enters mobile sensor market with VGA sensor for MediaTek 62-series handset reference design, according to the newspaper's sources. The sensors are shipped to Compal and Arima and manufactured at UMC 8-inch fab. The sensors are packaged with XinTec's chip on glass (COS) bonding technology. Pixart is expected to ship 2-3 million sensors per month in 2010. The shipments are likely to jump to 5 million units per month in 2011, according to Digitimes' sources. The margins are said to be low, so these products only account for a single-digit share of Pixart's total revenues.